The Youth Entrepreneurship Summit (YES!). YES! is designed for Native high school and college-aged students interested in business and entrepreneurship to hone their skills and learn more about what it takes to become successful in business. There will also be sessions to give attendees an overview of some of the basic topics important to success in the business world. YES! will be interactive, so participants should come prepared to discuss their potential ideas and interests, or simply be ready to ask questions to the people who have “walked the walk” in the world of business. JULY 11, 2016 Hard Rock Hotel & Casino • Tulsa, OK 10 a.m. to 5:00 p.m.
Click here to learn more and get started on your application! Additionally, you can contact (480) 545-1298 for more information, including answers to questions, instructions and guidelines. Apply by March 17 for the Stanford MBA Future Leaders Program! Stanford MBA Future Leaders Program! The Stanford MBA Future Leaders Program is a three-day residential event that introduces students from diverse backgrounds to an MBA education and post-MBA career opportunities. Engage in innovation and leadership activities. Gain exposure to the Stanford Graduate School of Business (GSB) and Bay Area communities. BA A401 Alaska Native Corporation Business Management CRN 73401. This is a great class for new employees at both Alaska Native organizations and private sector companies doing business in Alaska alike as we cover a range of topics including: Tribes in Alaska their history and purpose, the Alaska Native Claims Settlement Act – the journey to ANCSA and today’s ANCSA issues, the reservation model compared to the ANCSA model, Alaska Native Corporation (ANC) corporate governance, The Board of Directors, 7(i) sharing, 8(a) government contracting, opening enrollment, village and regional corporations, Alaska Native non-profits and so much more. Additionally, in this class we highlight some phenomenal speakers who join us throughout the semester and provide current, relevant overviews of these topics. We have had wonderful participation from leaders of these dynamic entities, both for-profit and non-profit Alaska Native organizations. BA A401 is a 400 level course, and although it has prerequisites, those can be waived for students taking this class out of special interest. Again, a wonderful learning opportunity for new employees. This is also a great overview for those just wanting to learn some of the history of these important topics. Consider declaring the minor or taking one of the classes as an elective or out of special interest as an Undeclared student. 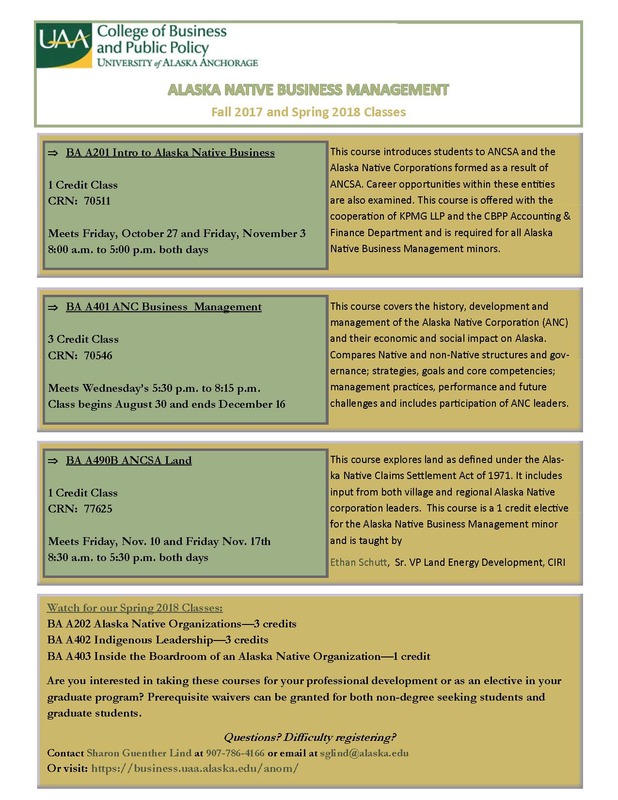 BA A201 Introduction to Alaska Native Business – CRN 79080 – 1 credit, meets October 30 and November 6 (two consecutive Fridays, all day, lunches provided both days.) This is the first class in the minor and suits Freshman and Sophomore students very well, or those wanting a first time introductory overview of these dynamic organizations. BA A401 Alaska Native Corporation Business Management – CRN 73401 – 3 credit, meets Wednesdays 5:30 p.m. to 8:15 p.m. This is a more in-depth of Alaska Native corporations and is perfect for upper-division students or current employees, especially new employees, wanting a closer look at the history and current perspectives of the leaders who formed and currently run these organizations. This is a wonderful opportunity to learn about a unique sector of business within Alaska. If you have any questions about these classes or the minor please contact Sharon Lind at sglind.